Technomancy.org just released a Google Suggest Venn Diagram Generator, where you enter a phrase and three ways to finish it: for example, “(Bible, New Testament, Old Testament) verses on….” It then creates a Venn diagram showing you how Google autocompletes the phrase and where the suggestions overlap. 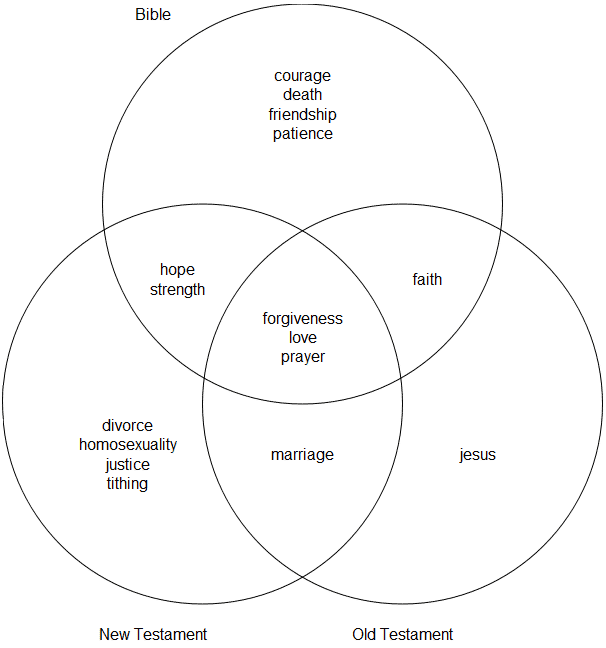 The below diagram shows the result for “(Bible, New Testament, Old Testament) verses on….” The overlapping words–faith, hope, love, forgiveness, prayer–present a decent (though incomplete) summary of Christianity. You are currently browsing the OpenBible.info Blog blog archives for October, 2010.